As this blog has evolved over the course of the last eleven(!) years, so too has my approach to recipe selection and development. The more readers trust me to provide recipes that are delicious, reliable, and worth their time, the more I strive to deliver. In my kitchen I always make the food that I want to make, but I only share the food I think you would want to make, that deserves your consideration, and has been carefully tested by yours truly. In the early days I couldn’t have imagined testing a recipe more than once or at most twice before slapping it up on these pages but now I generally expect that three rounds of testing and tweaking will ensue before a recipe makes its way to you. Earlier this week, I made this tropi-cobb salad and had a gut instinct while I was making it that it was ready to be photographed right then to be shared with you as soon as possible, and it was such a funny feeling. It harkened back to ye’ ole’ days of blogging and also went against all of my learned instincts. This salad truly is exactly what I want to eat right now. Summer cooking can be a challenge because the heat makes me want to avoid making anything too labor intensive or requiring a ton of time at the stove or oven, and the good weather makes me want to go outside and enjoy it. I love this salad because it is fresh and light while still super satisfying, and it doesn’t take too much time to throw together. Get the chicken in the marinade straight away and while that is doing its thang, prep the rest of the salad ingredients. The end result is perfect summer fare! The flavors excite my tastebuds and the colors are simply beautiful. The kids loved this too, although they both complained about the basil leaves being left whole. While I think that’s crazy, maybe opt for chopping the basil if you have finicky palates to consider. It made for excellent leftovers as well! I packed the whole thing in a single container with the dressing and toppings on the bottom, lettuce on top, and was careful not to let it get shaken up before lunchtime. It worked great and now I have another excellent healthy recipe to rely on. I hope you love this as much as I do! To prep the chicken, combine the lemon juice, garlic, salt, paprika, coriander, cumin, and oregano in a shallow dish. Whisk to blend. Add the chicken thighs to the mixture and mix to coat well. Let stand about 20-30 minutes while you prep the rest of the ingredients. 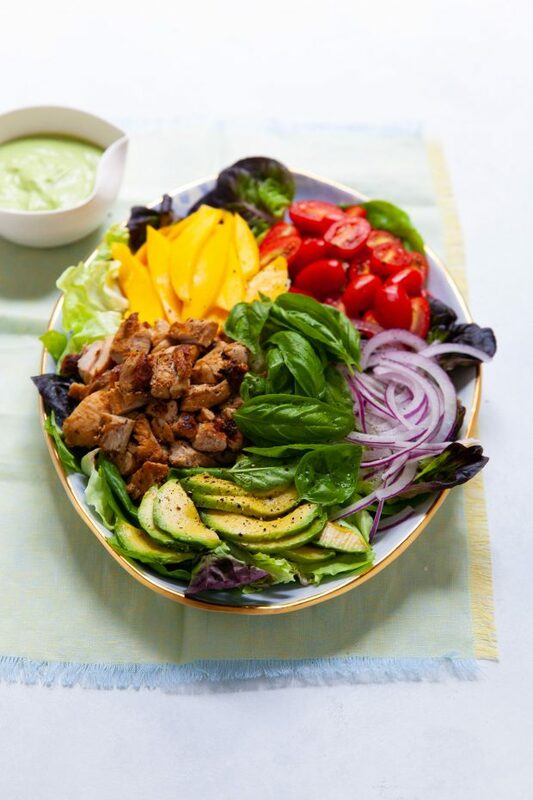 To make the dressing, combine the avocado, 4 tbsp. of the buttermilk, herbs, olive oil, garlic, and salt in a liquid measuring cup. Puree with an immersion blender until smooth. If the mixture is too thick, add additional buttermilk to achieve the desired texture. To cook the chicken, heat the olive oil in a large heavy skillet (preferably cast iron) over medium-high heat. Once the oil and pan are heated, add the chicken to the pan in a single layer. Cook until beginning to brown on one side, about 4 minutes. Flip and cook on the second side until nicely browned and the internal temperature reads 165˚ F on an instant read thermometer. Transfer to a plate and set aside to rest for a few minutes. Chop into bite sized pieces. To assemble, distribute the lettuce on a serving platter (or individual plates). 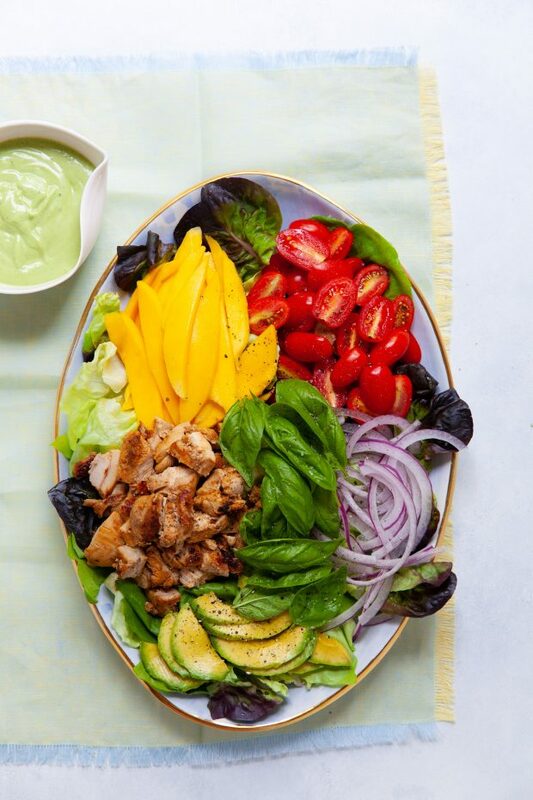 Top evenly with the avocado, mango, tomatoes, onion, basil, and chopped chicken. Season with salt and pepper. Drizzle dressing over the top as desired, and serve. To remove some of the “bite” from the onion, add the onion slices to a bowl of ice water for a minute or two. Remove and drain well.